The protesters held recently euthanized dogs that were collected from a local veterinarian in Los Angeles. The intention of using deceased dogs was to create a 'shock factor'. In a bid to stop the dog meat festival in Korea, actress Priscilla Presley and a slew of other stars held the bodies of dead dogs outside the Consulate General Of The Republic Of Korea. The protest, which was organized by LCA (Last Chance For Animals) and Animal Liberation Wave, was held on Tuesday. Priscilla was joined by actress Kim Basinger, celebrity hairstylist Mitch Stone, voice actress EG Daily, and ex-Baywatch actress Donna D'Erico. 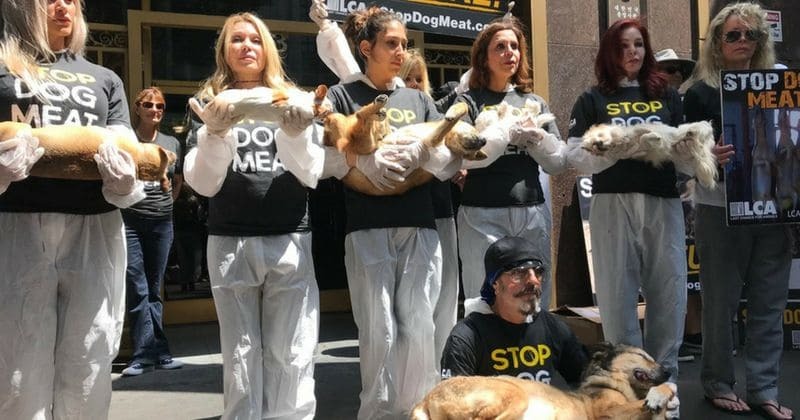 Donna, EG, and Priscilla were spotted holding bodies of dogs, while Kim Basinger and other animal activists held pictures of slaughtered animals. According to The Blast, the protesters held recently euthanized dogs that were collected from a local veterinarian in Los Angeles. The intention of using the deceased dogs was to create a 'shock factor' for the crowd. Last Chance For Animals hoped that the bodies of the deceased dogs were an example of the other lovable dogs that are killed for consumption in South Korea. The founder and president of Last Chance For Animals, Chris DeRose, also reconfirmed the reason behind why the activists used real dead dogs during the protest in a Twitter post. Sources also told The Blast that the stars were given gloves to handle the dogs. Following the demonstration, the dogs were to be 'respectfully cremated'. "No protest has been this powerful, the greatest ever. Salute . @LC4A, Christina, Jess and Sylvia flown in for this demo and all the young local activists. Many folks in South Korea also stood against the dog meat festival, branding it barbaric and disgusting. Protesters took to the streets to raise their voices for the voiceless. A video shows a group of young activists taking to the street to protest the dog meat trade, by holding a funeral procession. Other celebrities have also been very vocal about the protest of the dog meat festival. Stars in Hollywood banded together to protest the consumption of dog meat as well as the Yulin Dog Meat festival which takes place every year in China.